What to do with old stored dye solutions? Among the other stored solutions that cause me some heart-searching are oak-gall and walnut hull solutions. In the end, I’ve decided to offer these to other dyers in my guild, so for the moment I can avoid having to make a decision. However, if no-one else is interested in them, I’ll probably discard all the oak-gall solution, as I have enough oak galls to make some more and it’s not something I tend to use frequently. And I’ll probably decide to make some space in my shed by discarding some of the walnut hull solutions too, as I have dried walnut hulls and some walnut extract to fall back on anyway. These solutions will enrich the compost heap, I’m sure. And now to the woad solutions I’ve found, all stored in 5-litre containers. (Details for making woad solution for storage are in my books and are outlined below.) Two containers are labelled “2008” and the contents look blue and have the characteristic woad smell. So I’ve decided these can be left and used at a later date. The other container doesn’t have a date on it and the state of the label suggests it may have been lurking in the shed for quite some time, possibly several years. On inspection, the solution looks a rather unpromising pale brown and it doesn’t smell “right” either. But I’m not prepared to throw it away without trying it out, as I know from experience that even the most unpromising-looking solutions can sometimes yield good results. So I pour off the contents of the container and I can see that some of the blue pigment has sunk to the bottom or stuck to the sides of the container, leaving a pale brown liquid with some particles of indigo pigment floating in it. I check the pH of this liquid and it would appear to have lost some of its alkalinity. So I make a solution of washing soda dissolved in boiling water and stir this into the woad liquid until pH 9 has been reached. Then I return some of the solution to the container and shake it vigorously to try and dislodge some of the blue pigment from the sides. I also use a wooden spatula to scrape as much as I can reach back into the solution. I decide to try out the solution, so I pour it into a dye pot and add more water to make enough liquid for the vat. 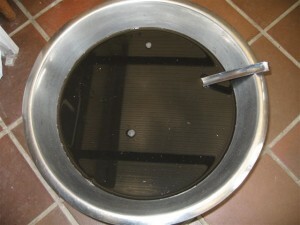 This shows the solution, with the extra water added to make the vat. Once the solution has been heated to about 50C and I’ve added sodium hydrosulphite to remove the oxygen, it starts to look more promising. The metallic-looking blue sheen that has formed on the surface indicates the presence of blue pigment, so I stir it gently to one side and then add 300gms of Wensleydale wool yarn and watch as the sheen disappears, leaving yellow liquid, through which the skeins are clearly visible. Then I leave the skeins to steep for about 20 minutes. 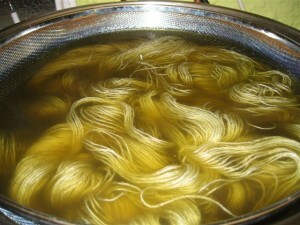 This shows the skeins steeping in the vat. Then I remove the skeins and I’m pleased to see that they have dyed a good mid-blue, so I’m delighted I didn’t throw the solution away without trying it. 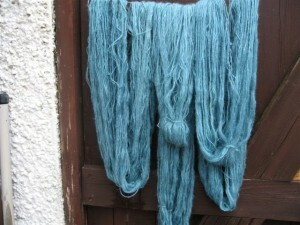 This photo shows the dyed skeins. So what would I have done, if the solution had proved useless and the skeins had failed to turn blue? Well, I had already prepared for this possibility by making a solution of indigo powder and washing soda, ready to add to the woad solution in the pot if necessary. (I dissolved 3 teaspoons of washing soda in about half a cupful of boiling water, allowed it to cool slightly, then mixed in 3 teaspoons of indigo powder.) This solution will now be stored in a tightly-sealed glass jar until I decide to make an indigo vat. So instead of reducing my stock of stored solutions, I seem to have kept the situation exactly as it was, by using up one stored solution and then replacing it with another! 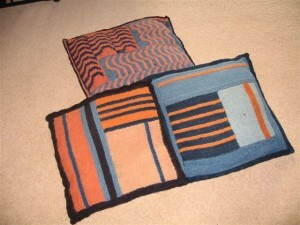 The photos below show some cushions I knitted recently for my daughter, who wanted a “modern design using oranges and blues”. I’m not sure to what extent the patterns I designed can be described as “modern” but at least the colours are right! The dyes I used are my old favourites – madder and indigo. To achieve an orange shade with madder, I used about 25% madder on an alum mordant and then applied an acidic modifier made with clear vinegar. The paler shades were from the exhaust dyebath. 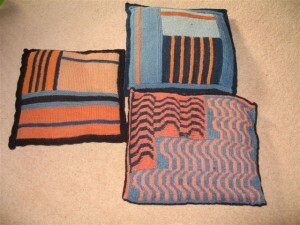 The knitting technique I used for the cushions is a form of patchwork I use fairly frequently for cushions and bags. I start off with a square or rectangle, then pick up stitches along one side and knit in that direction for a while. I leave these stitches on a spare needle, or a length of yarn, and then I pick up stitches from another side and knit back and forth along that edge for a while. And so on. The designs develop as I knit and give me plenty of scope for colour patterning as well. For the reverse side of these cushions, I dyed some woollen fabric in indigo, cut it to size and then stitched it onto the knitting. I made an opening for the cushion pad by overlapping the edges of fabric, as with a pillowcase, so it will be easy to remove the cushion cover for washing.